“You’re not leaving this table until you clean your plate.” Famous words parents all across the country have spoken to their children. The clean plate club created habits that my parents enforced through my childhood, and the other day I realized the utter stupidity (and even danger) of its membership. I was sitting at a business lunch with four colleagues. We were wrapping up our lunch, and the waiter was bringing our check when one of the guys remarked to me, “I guess you’re not a part of the clean plate club.” He was a dad and was a card carrying member and proudly carrying on the tradition of his parents to his kids. We laughed, and I looked down at the bites of potatoes and chicken remaining on my plate. My down-turned fork did not announce my intentions well enough. The guilt should have consumed me, right? On my plate represented the average of about 30–40% of food wasted in America each day. I was subtly asking the waiter to usher my refuse into the pile with all the other forsaken food, and I had no qualms about it. How very American of me. Let me back up. About 18 months ago, I began a journey to better health. One by one, I started evaluating myriad decisions–behaviors I had never questioned. Of course, the obvious “eat less and move more” was the basis, but deeper than that, I began to ask why I had established these habits in the first place. One of the worst habits is a compulsion to eat too much. With double portions and high price tags, it seems a shame to let one morsel go to waste. However, I made a conscious decision to eat slower, push back from the table when I’m full and have zero guilt about throwing excess food away. Small plate that lunch. The food I throw away at that restaurant has no impact on the shortage around the world. In fact, if more of us pushed away, maybe the restaurants would serve less. Who knows, maybe the restaurants could invest the savings into hunger relief efforts. So, what’s the clean plate club have to do with my life? Here’s the problem: we never push away from the table. Salmon patties and baked chicken were two of my least favorite meals, but hungry or not my mom insisted that I clean my plate. When we translate this behavior to the figurative plate of life, we feel just as compelled to finish everything that’s on our plate—even when we don’t really like or need to do everything in front of us. Work is good. Busyness is not. Just as there’s ample food in the U.S., there are ample demands vying for our time too. We seldom push back from the table of life to figure out what is most important and focus on that. Instead, we work hard to finish the everything—like it or not. The recent expose of Amazon’s work conditions is a great example of not pushing away from the table. Managers are telling their employees that either they’re gluttons of work. If they were unwilling to clean their plate, they are deemed to not be a fit. Between the community service requests, the Saturday calls from the boss, and home projects that “must be done,” it’s easy to get wrapped up in just doing while our being is crowded out until another day. The tyranny of the urgent wins another round. Eventually, the nourishment of our souls is jeopardized. We need to make time to push away from the table, to allow the food to digest, and refresh for another day. Instead, many of us adopt the Amazon approach to life, which suggests that we work 80 hours a week and neglect the things that are truly important. 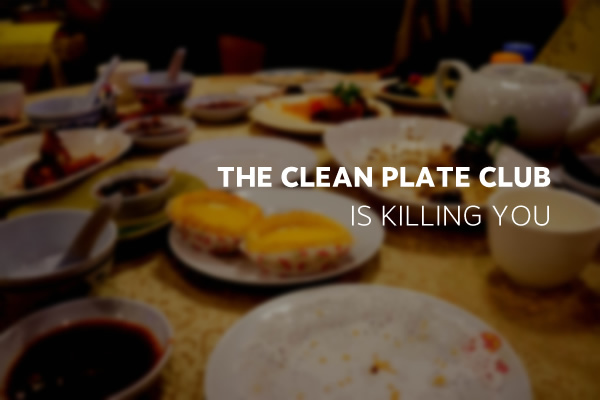 So, next time you find yourself under the social pressure of joining the “clean plate club,” just remember the pusher probably lacks the self-discipline to say no. Be a model. Be an example. Push away from the table. Charles, thank you so much for allowing me to use your picture. It’s rad.